She doesn't like looking at it or thinking about it, and when the paints come out in the art class at school, she just can't stand it. "Anne Fine is an author who knows how to make readers laugh." Anneli the Art Hater , a book by Anne Fine for children in the middle age range, was first published in 1986; the revised edition was first published by Egmont in October 2002. The new edition was substantially re-edited by the author, who has written about some of the changes she made in an article explaining to parents and teachers why she has been updating some of her books. Order the new paperback edition (or ask your local bookshop or library to order it, quoting the ISBN: 978-1-4052-3323-1). 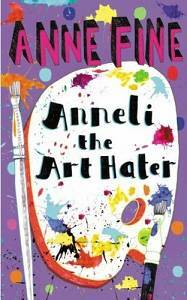 Anneli the Art Hater was also published in a Galaxy Large Print edition (ISBN: 978-0-7451-3093-4), now out of print.